In each moment we have a choice – we can choose to see ourselves, others and our environment in a way that creates happiness and meaning, or in a way that fosters depression and disappointment. Through the wisdom of modern Buddhist psychology we can learn meditations and actions that help transform our mind and become the confident, happy person we wish to be. The evening will wrap up with refreshments afterwards and time to socialize with Gen Rigpa and other members of our spiritual community. Everyone is welcome. 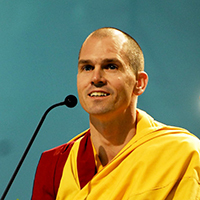 Gen Kelsang Rigpa is an American Buddhist monk, the Western US National Spiritual Director and the Resident Teacher at KMC Hollywood. He is a close disciple of Geshe Kelsang Gyatso, having received lineage blessings and oral transmissions directly from him. Gen Rigpa’s heartfelt and practical teachings are presented with warmth and humor, making them accessible to everyone. 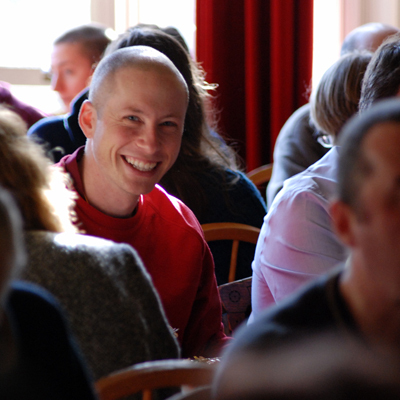 He shows the joy of living a spiritual life, and is an inspiring example of Buddhism in practice. Through his clear presentation, he is able to help students discover for themselves how to integrate these timeless teachings into our modern world, making everyday life joyful and meaningful.